It’s that time of year again, savvy shoppers are trying to get the best Christmas bargain, families are gathering round a naked Christmas tree; baubles in hand, and exhausted teachers are stressing over nativity scripts. However, the attendees of St Bernadettes school are taking it to another level, by attempting the mammoth task of producing a musical version of a nativity play! Performed by a west end cast, talented children and maybe even a fluffy friend, Nativity! the Musical features comedy, sing-a-long songs and a whole load of chaos. Debbie Isitt, directed both Nativity! the Musical and the original film version. The film, which was created through partial improvisation, is part of a trilogy which includes: Nativity 2: Danger in the Manger and Nativity 3: Dude, Where’s my Donkey? The musical follows the same story line with all the best loved songs of the film, but with a few added extras. Although we all love a festive film, Nativity! the Musical has “Sparkle and Shine” running through the songs, set and costumes. It tells a tale of Mr Maddens (Daniel Boys), who is desperately in love with Jennifer Lore (Sarah Earnshaw). She broke Maddens’ heart just before Christmas when she left Coventry to pursue her dreams as a Hollywood producer. 5 years on Mr Maddens has the chance to direct the school nativity, with initial dismay, but soon realises this might just be his chance to win back the love of Jennifer. 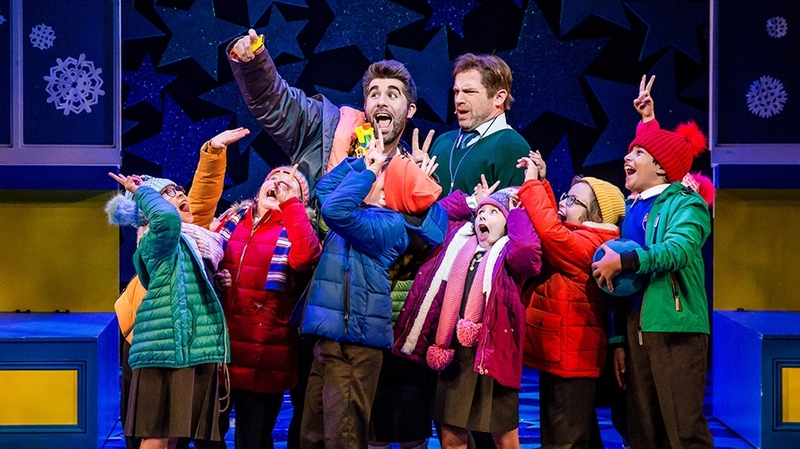 Mr Maddens is joined by newly appointed classroom assistant Mr Poppy (Simon Lipkin), who is eager to fuse pop tunes and rapping with the classical nativity play, accompanied by his scooter and lunchbox. I will forgive the dodgy (and fake) tap dancing in the opening scene, only because Mr Poppy began to sing completely in tune, all while swinging a hula hoop around his neck. His modern humour was carried through the whole production making this musical by the Birmingham Repertory Theatre enjoyable for both children and adults. A particular laughter-with-tears moment, although there were many, was when Mr Poppy lifted Evie in a true Lion King fashion while chanting Ah Zabenya to the audience. St. Bernadettes tackled a range of musical mishaps while facing shutdown after a failed OFSTED inspection. And yet, they still managed to pull off a handful of star studded numbers accompanied by an almighty, and slightly unconventional death slide (that was Mr Poppy’s idea). The children of the cast definitely need a special mention as they entertained with continuous comedy and brought a few handstand-walks and high kicks to the finale. Admittedly, I found myself stubbornly digging in my heels as I was being dragged into December. That was until I watched Nativity! the Musical, which has prepared me to embrace both the stresses and excitements of Christmas, but perhaps thankful that my nativity days are over. Let’s leave it to the kids eh.